Have you ever tried to speak and public? You probably did it once and then you realized that you’re shaking from the anxiety of hundreds of people watching you, words starts to stutter and then you feel like you’ve just made yourself look foolish in front of the crowd. You probably have this kind of problem before. 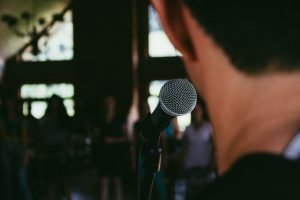 Public speaking isn’t as easy as many people think it is. Your mind have to be on top of the situation and you really can’t focus if there are hundreds of eyes in front making you distracted. You start to tremble from all the anxious sensation. People inevitably develop intense fear of speaking in public. Fortunately, there are some ways to overcome this kind of fear. We should also realize that mistakes happen. You stutter and might have choked in a few conversations you do normally and that’s ok too in public speaking. You eventually get used to speaking and over time, become skilled in presenting your conversation. When starting a speech in front of hundreds of crowds. You might want to start by breaking the ice. Usually, people don’t realize that whenever you speak in public, it’s always necessary to start first by warming up to the people you are speaking too. If you did that, people won’t judge you right away especially since they will be developing a sense familiarity with you. For more tips on how to overcome public speaking, please view here. There are also a lot of public speaking coaches you can find. You can always try to get help in improving your skill.